Rich in emotional images, often tender but more often terrifying, THE PATRIOT GAME tells the story of the long and bitter battle for Northern Ireland. The film's introduction covers Ireland's history from British colonization to the territory's division in 1922. THE PATRIOT GAME then details the events of the decade that began in 1968. 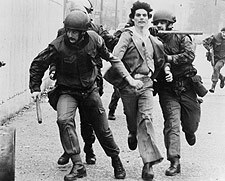 Through powerful portraits of rebellion and eyewitness accounts of killings and such massacres as the infamous "Bloody Sunday," the film shows the IRA at work - much of it filmed clandestinely - as they argue their cause which, in this country and in most of the world, has gone unheard.